Before departing for Zambia last week, our team in Nigeria enjoyed a farewell service on Tuesday at the WECA headquarters in Anthony Village. John Musgrave, Director of Africa Work, reported that 1778 attended, and it opened with an impressive children’s program. He said, “They did a wonderful job presenting the story of a man who dreamed he was in the heavenly Jerusalem and heard angels singing. He pondered the message, was saved, and put on a white robe, while about sixty children dressed as angels flapped their arms. They also sang “All Over the World,” with different ones reciting verses from the Book of Revelation concerning Heaven.” The rest of the farewell service included music from the choir and orchestra, testimonies, and a message. It was a nice conclusion to the Musgrave’s time in Nigeria. On Thursday they arrived in Zambia, where camp meeting was to begin the following Sunday. With a free day on Friday, Rev. Timothy Kaibula, District Superintendent of Eastern Africa, and his wife, Sowe, took the Musgraves to a 10,000 acre game reserve for a safari ride where they were able to see many of the local wildlife. 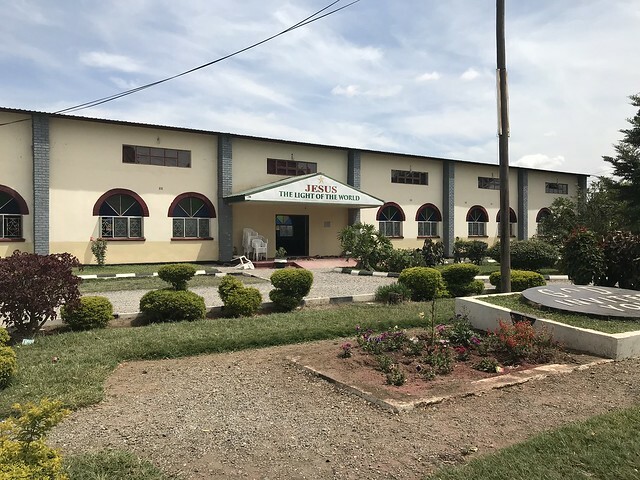 The following day, they went to the John Howard church site where the Zambia camp meeting is held, and then toured the ten-acre plot which is to be the future camp meeting location. A four-classroom elementary school building is nearing completion, which will become a source of income to help with the development of the rest of the property. It currently serves as a camp meeting dorm with several lodged there this year. Camp meeting opened on Sunday morning with Sunday school, attended by over one thousand. The visitors from world headquarters were welcomed by the children before going to the prayer room. At the morning service, the tabernacle was filled to capacity with some standing outside and watching through the windows, 1221 in all. Brother John said the children did an outstanding job performing a program with the theme “God has a job for you to do, and if you do it, you’ll receive a crown.” The choir later sang “Come, Holy Spirit” and “Have Thine Own Way,” and an octet sang “Fit for the Master’s Use.” At the evening service, Reverend Francis Chipoya, a Zambia board member and pastor of the Kuku church in Lusaka, preached from 2 Chronicles 7:14, emphasizing the need to pray. At the close of both services, people rushed to the altars before the invitation was given, with several earnest, hungry seekers breaking through. On Monday there was a worker’s meeting in the morning, and then a concert in the evening, featuring the choir, orchestra, and various instrumental and vocal ensembles. Some highlights were “He Is Risen” and “Resurrection” by the choir and orchestra, “Amazing Grace / I Shall Fear” by a male quartet, and “Revival” by a male choir. Of the entire evening, Brother John said, “They did an outstanding job and the congregation roared their approval at several of the selections.” He also mentioned that the vocalists harmonize beautifully, and that he has been enjoying listening to some of the video clips his wife was able to record. They especially enjoyed the songs that were composed and sung in native languages, including “Wayumuna (He Carried Our Burdens)” by the brass and choir, and the finale piece, “Rula Lweendo Lwakujulu (Travelling to Heaven)” by the choir and organ. During that last song, the congregation was encouraged to join for the last two verses, and as they stood for the final verse, many rushed to the altar again for another great altar service. The schedule on Tuesday and Wednesday included Bible teachings in the morning, meetings in the afternoon, and evening services. The Musgraves said the Zambia camp meeting was already off to a great start, though they have now departed to begin their journey home. We pray God will continue to be with those gathered at the camp meeting, and also with the Musgraves as they travel.